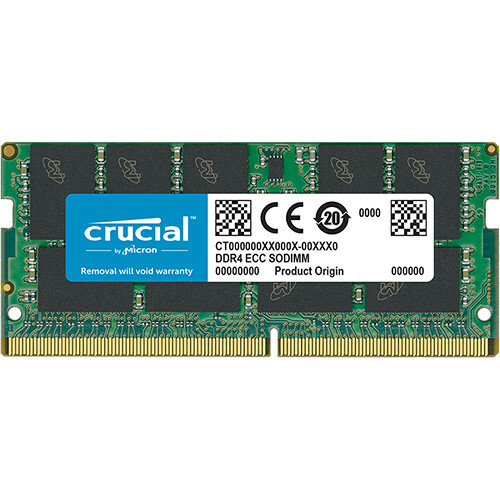 The 16GB DDR4 2400 MHz SO-DIMM Memory Module from Crucial is suitable for servers that require high-performance memory. The 16GB memory module is unbuffered, features ECC, and has a CAS latency of 17. Box Dimensions (LxWxH) 6.4 x 1.8 x 0.4"
16GB DDR4 2400 MHz SO-DIMM Memory Module is rated 5.0 out of 5 by 1. Can this work with other 16gb pc4 17000 2133 ECC on zbook g3 studio with xeon cpu ? Yes, based on the information you gave me, it will be compatible. Is this compatible with the Thinkpad x260? This memory module is not compatible with the x260. You would need 1 x 16GB PC4-2133 SoDIMM.